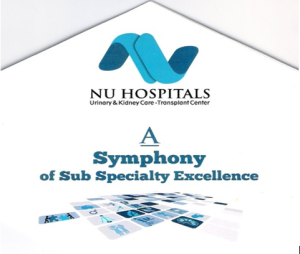 NU Hospitals unique differentiator is its excellence in sub specialties ; Pediatric Urology, Pediatric Nephrology, Neuro Urology & Uro Dynamics, Uro-Oncology, Kidney Transplantation, Holmium Laser Treatment for Prostate Enlargement , Andrology, Laparoscopic Urology, Preventive Nephrology, Vascular Access- AV Fistulas & AV Grafts and Plasmapheresis. NU Hospitals are also present at KM Hospitals Ambur, TCR Hospitals Krishnagiri &Pearl Clinic Male, Maldives and will soon commence services at Vaatsalya Hospitals – Hassan and Chickamagalur. NU Hospitals Rajajinagar has installed the world first antimicrobial PVC wall cladding containing BioClad Technology for its most advanced state of art Operating Theaters with a view. The Hospital amongst others has Remote dialysis monitoring system, high end Lasers for stone and prostate, renal papillary necrosis removal, advanced Operating Theaters, specialized ICU’s with a separate Pediatric ICU, state of art IVF Lab, Urodynamics, motorized cots and specialized pressure sore prevention mattresses. NU Hospitals offers Video Co-Consultation in its networks and has installed PACS that integrates the entire image viewing and radio diagnosis facility. NU offers a distinct patient experience with Spacious sofa seating lobbies, Happy to Help sofa side service, Open Pharmacy, Motorized OPD Patient Examination Bed, Business center with free Wi-Fi, Separate waiting lounge for ICU, Ground floor Café, Terrace floor Cafeteria, Large In Patient Attendant Lounges, Special Rooms for Overseas Patients and Suite Rooms. NU Hospitals endeavors to offer expert advice and ethical treatment in a highly personalized and warm environ, sans the trappings of typical corporate hospitals to deliver affordable care with good outcomes. Dr Venkatesh Krishnamoorthy, MBBS, MS, M.Ch, FRCS is the Chief Urologist &Chairman of NU Hospitals. He is prestigious BC Roy Awardee and one of India’s top Urologists and is widely acknowledged across the world as an authority in Urology and Dr Prasanna Venkatesh, MBBS, MS, DNB (Gen Surgery), DNB (Urology) with a fellowship in Pediatric Urology is Consultant Urologist and Managing Director of the Company with a stint at the Boston Children’s Hospital and is one of the rare specialist pediatric urologist in the country addressed the press meet at NU Hospital Rajaji nagar.